We used to call them ‘demos’, demonstrations against the things that troubled us. These days we call them rallies. We rally against or we march against. We no longer demonstrate. Why the shift I wonder? Why not demonstrate, remonstrate, jump up and down against the things that appal us? Like our treatment of asylum seekers. No point in getting into a rant. No point in getting hot under the collar on the page. Best to go out there and protest, but elsewhere I read from someone online that they think all these marches and rallies are just a waste of time. Worse still they’re a way of appeasing people’s guilt so they can go home after each rally feeling they’ve done their bit and no longer need to worry about the fact that not much of anything has changed for the better for asylum seekers in this country. Though I reckon it will change. It has to change. One day apartheid stopped in South Africa. One day the Berlin wall came down. One day the Vietnam War ended. But each new atrocity is followed by others. My optimism about the good of human nature wanes. At the same time, I refuse to get onto the bandwagon that says things are getting worse, apart from in relation to the climate. Things go up and down. I’d prefer to be living today as against living in medieval times, but if I lived in medieval times I might have preferred that era to the previous one. You make the most of what you have, if you have the sense, and there’s not much point in hoping for something else from before your time or into the future that’s out of your reach, except when you daydream. Delicious day dreams like when you win Tattlslotto and how you’ll do this and that, get rid of your debts, buy all your children a house, donate to charity, too. But from what I’ve read, it rarely works out that way for folks who win the lottery. Last weekend, I cleaned out the trunk that sits under my desk, which I’ve filled with Christmas and birthday cards and other memorabilia from my past. It took the best part of the day and put me in touch with my childhood and adolescent selves, folk I scarcely recognised. Thank goodness I went to university. Without it, I fear I may have stayed stuck in my puritan mentality. 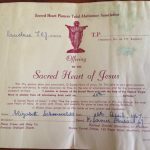 Among the treasures, I found a certificate signed by the head nun from my school certifying my pledge to abstain from all intoxicating liquor until my twenty fifth birthday. 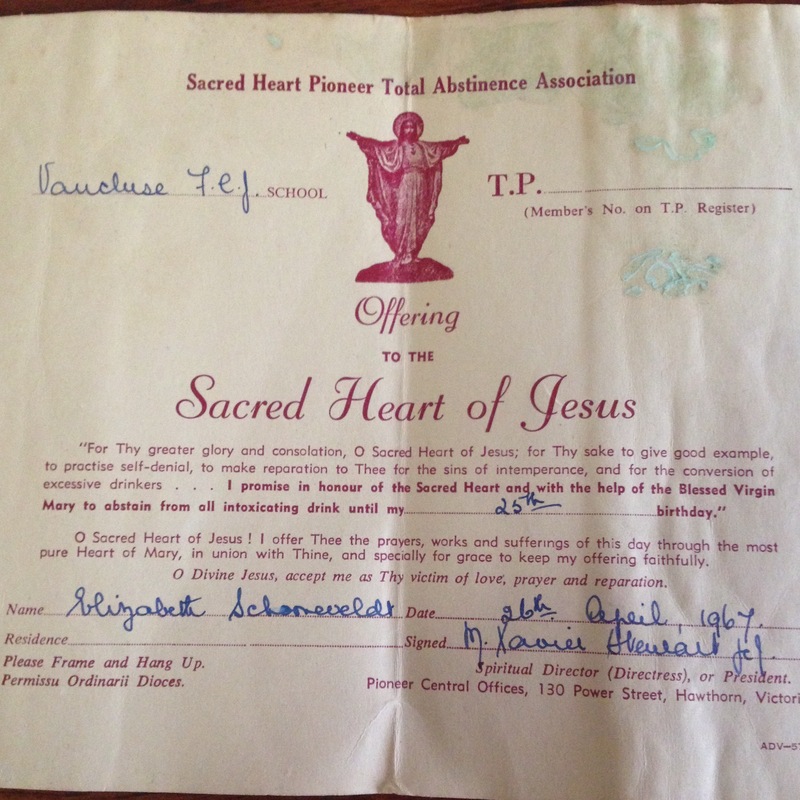 The Sacred Heart Pioneer Total Abstinence Pledge. My first alcoholic drink came in the form of a Brandy Crusta, which I sipped in a bar beside the Edithvale beach, while I was visiting my first serious boyfriend. It had a sweet though sharp edged taste from the bitters and I waited for the heady sensation to follow. I looked out across the waves and noticed them shimmer more than before I had taken those first few sips. Could this be it? The lure of the demon drink? There was a delicious taste of wrong-doing in every mouthful. Nineteen years old and I was breaking my promise to the nuns and to myself that I would never be like my father, who had lost his head to alcohol. Before that day, alcohol was the beery smell that wafted out of the Palace Hotel whenever I walked past on a Saturday afternoon on my way down Burke Road to the Camberwell shops. It was the chemical smell that stained the bottom of the sherry glasses left out in the mornings after we had visitors. It was the unlabelled brown paper bags in which my father hid his bottles of Saint Agnes brandy, the ones with three gold stars and a picture of the saint in green on the front. It was the stack of empties in the outside laundry where my mother stashed those bottles every weekend. Alcohol was the man who came to our front door one night asking for money. My older brother answered and told him we had no change, which was true no doubt. But it seemed an odd thing that we should turn away one drunk, while my father inside was also sunk low on alcohol, as low as the beggar who had come to our front door. The shame of it all, my fifteen-year-old self thought. To have a father who could not control his drinking and who would one day wind up in the gutter. Always the gutter, never on the streets. In those days I did not consider where my father had come from, what he had been through, even as my mother pleaded for us to show our father some respect and to recognise his dreadful childhood. A dreadful childhood, I thought then, was no excuse for bad behaviour. These days, I consider it is every excuse, though it cannot justify worse behaviour. It simply makes it understandable. Still it’s hard to understand an entire nation’s bad behaviour. It’s hard to fathom why a whole group of us cannot recognise what’s going on in our own back yard, even when the rest of the world can see it. 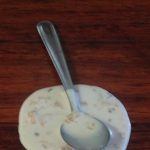 Years ago one of my daughters gave her father a trick spoon, a spoon that sits in a puddle of what looks like spilt milk and cereal, but which is in fact plastic. 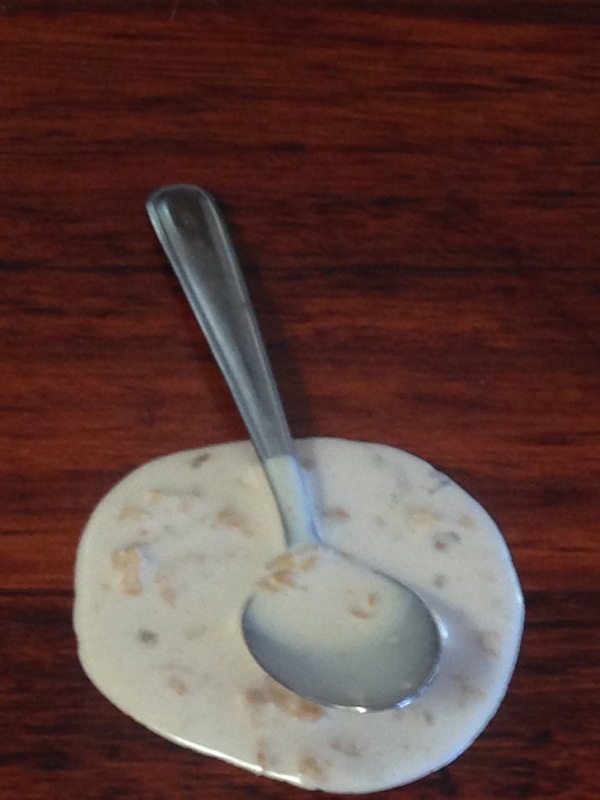 The trick spoon works well. Whenever an unsuspecting person sees it on a bench or desk top, they go to wipe it away. I showed it to my now five year old grandson the other day and it took him a moment to figure it out. I didn’t trick him with it but showed it to him and explained. He was most impressed and like many five years olds wanted me to repeat the joke for the rest of the day. We left it on the bench top and from time to time he’d say to me as we walked past, ‘Look, someone’s made a mess.’ And I’d give an exaggerated yelp and race for the dish cloth then try my best to wipe it up. My husband is a man of tricks. It’s nothing to find the hem of my dressing gown tied to the bedstead in the morning when I get up. I go to put it on and it won’t yield. It’s nothing to find a tissue shoved deep inside my shoe, or some unusual object, a wine bottle cork or a jam lid in my handbag. Whenever I find such objects I sigh and remove them, knowing my husband has been up to his tricks again. My husband’s tricks are benign. The stuff of boyhood, I reckon. They seem to work better on his colleagues than they do on me. In my husband’s office some folks take off their shoes, not out of custom but out of habit and for comfort. He tells me how he hides the shoes of certain colleagues in their filing cabinets or locker when they go off to the tea room barefooted. My husband has been known to tie laces together, though not while the shoes are actually on someone’s feet. That would be dangerous. I have a suspicion my husband is prone to tricks like this, not only for the amusement they offer, but also because they give him an odd sense of power. Perhaps it feels uplifting to be able to render someone else temporarily helpless and then restore order once the joke is out. Over the years, my husband’s jokes have worn thin, at least their effect on me has worn thin. My grandson, on the other hand, is as delighted as a new day. His eyes light up at the thought of turning innocent people into worried souls, desperate to wipe up the mess only to discover the trick and laugh at themselves for their misperception. But there’s a line between one person’s joke and another person’s horror. We hear about it often today, the young man who grabbed at the writer, Mary Karr’s crotch, as she unsuspecting walked down the street opposite him, might have considered it a joke. Mary Karr did not. She describes the horror she felt at the time of this violation and the process whereby she found the courage, despite being temporarily winded, to report it to the police, who took it seriously and found the culprit. 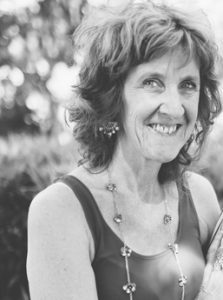 Karr needed the help of a homeless person who sat nearby, stretched out on a sheet of cardboard, a man who recognised her distress and told her to do something about it. His urging empowered her and turned the joke around. Some jokes are benign and others cruel, but all jokes are tricky. They can wreak havoc on someone’s equanimity as much as they can make another person’s day. The moral of the tale: All you jokesters out there, tread warily.